It was hot. It was steamy. 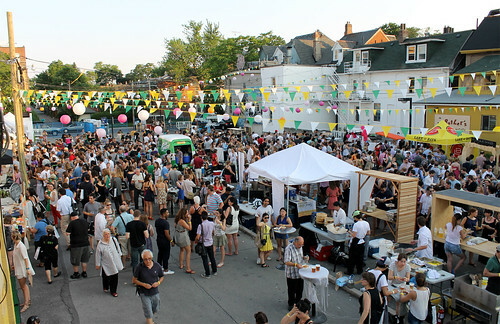 But the weather, as we welcomed the official start of summer, certainly didn’t stop about 1000 of Toronto’s foodies to gather in a parking lot last Wednesday evening for some delicious food and creative designs, all for the sake of a good cause. 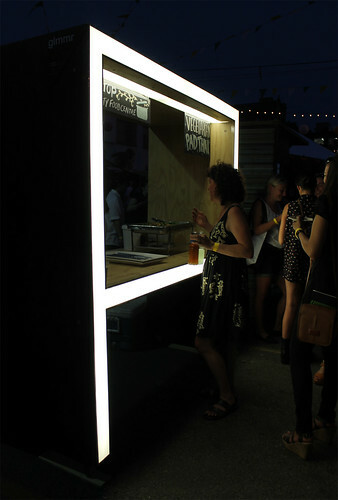 Aptly called the Night Market—taking note from street night markets of the world—the event was hosted by The Stop Community Food Centre, and paired food and drinks with design. 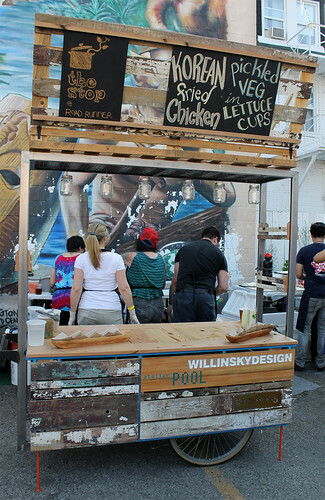 Each participating vendor’s booth was custom designed by local designers and design students, with the majority of the booths being built from reclaimed materials. I happened on this event a few months back when I saw a post about the event on Facebook. I quickly clicked on the link, and was brought to the Night Market’s adorable carnival-themed (seizure-inducing) website. While there still wasn’t too much information about the event, and they were still confirming vendors, I was instantly intrigued. The $50 ticket was a sweet deal for all you can eat food AND drinks. It made it much more affordable than some of the other fundraiser food events I’d love to attend but just can’t afford right now, including Toronto Taste and Picnic at the Brick Works. Best of all, with the advance payment for everything, I didn’t have to worry about anything else that evening except enjoying myself. I didn’t have to worry about cash. Or drink tickets. 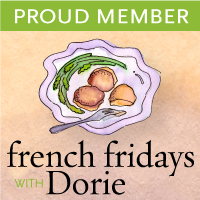 I could just have fun, and enjoy the food, art, and the company of my friends. 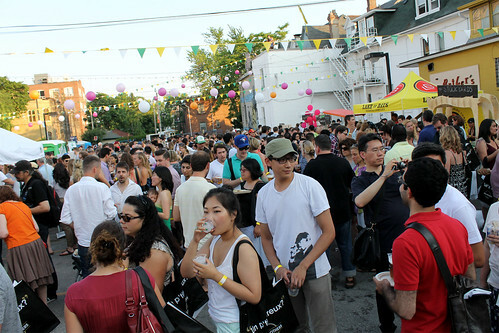 The event took place in the alley and back parking lot of Honest Ed’s, an iconic Toronto landmark in the Annex district. 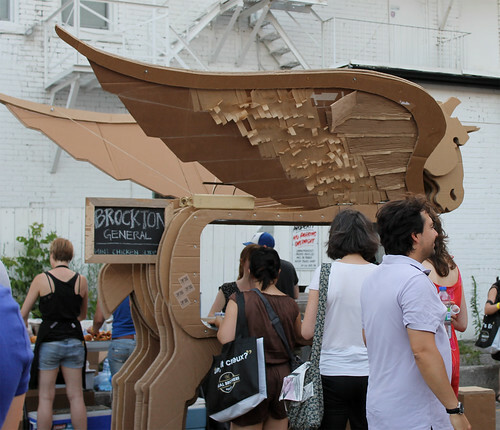 With the lot decorated with colourful flags and lanterns, the creative booths, and the existing art on the buildings that surrounded the lot, the space was definitely made magical and fun. The Stop's Korean fried chicken ssam with pickled vegetables—one of my favourite dishes of the evening. Messy to eat, but that's also the joys of eating ssams (lettuce wraps)! 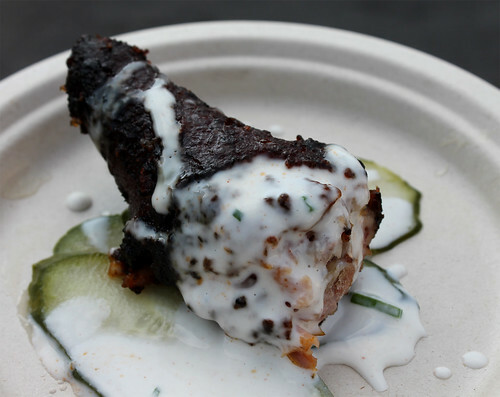 The Stockyards' barbecued pig tail with buttermilk dressing—crispy, fatty, and tender. Definitely finger-licking good. 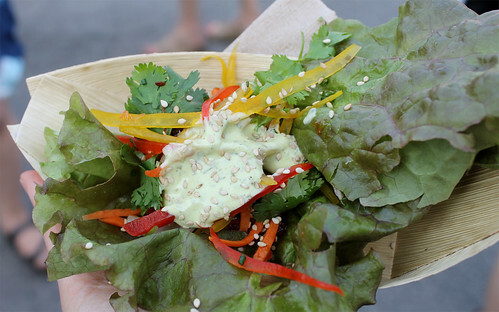 Vendors participating in the Night Market included well-known local restaurants like Yours Truly, County General, Cowbell, and Woodlot, as well as popular pop-up chefs and vendors like The Tempered Chef, Babi & Co, and FeasT.O. Food-goers also got a sneak preview of Paulette’s Original Doughnuts & Chicken, the latest project from Devin Connell (Delica Kitchen), which is set to open in Leslieville today (June 25). The new shop will specialize in doughnuts and fried chicken. Yours Truly's Pork Burger in Xi'an Spice—great flavours. 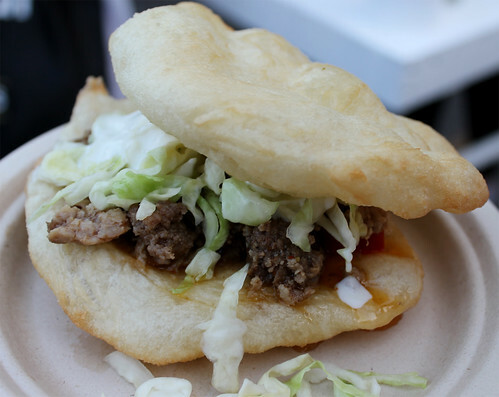 Really loved this with the puffy but soft fried bread, although ate this with the top off as a taco. While it was on the greasy side, this was also a favourite of mine for the night. 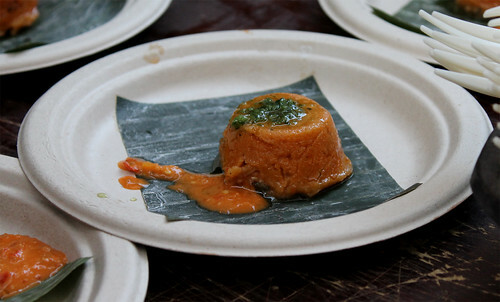 SupiCucu's Chicken Panamanian Tamales with Chef Rossy Earle's signature Diablo's Fuego hot sauce. 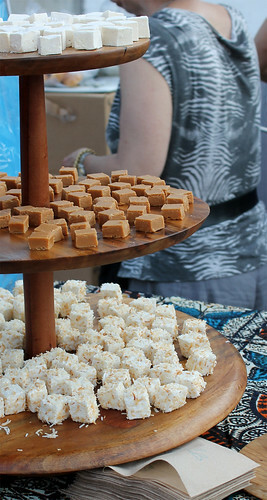 Jack & Lil's pillowy soft passion fruit and toasted coconut marshmallows, and fudge. Lots of food was consumed, and while I wish I was able to, there was just no way to sample all of the 20-plus vendors that were dishing out food. All in all, a fantastic event—great set-up; interesting variety of vendors; beautiful, unique space that marries food with art; affordable; and all for one great cause, helping to feed others who are less fortunate than us. I hope this event becomes an annual event. I’d definitely come back—the perfect way to kick-start the summer! View more of my photos from The Stop's Night Market here.